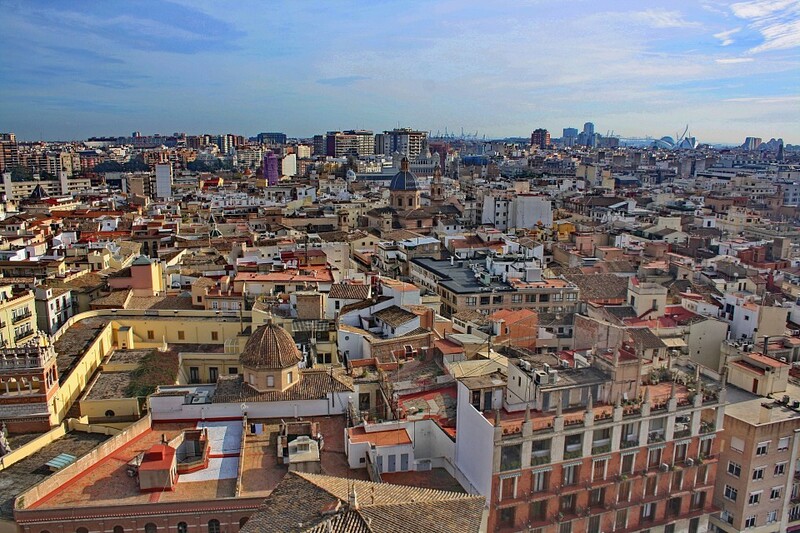 Valencia is the third-largest city in Spain after Madrid and Barcelona. It is the capital of the Valencian Community, or “Comunitat Valenciana” in Valencian, an autonomous community of Spain that borders the Mediterranean Sea. This beautiful seaside city is home to approximately 1.5 million people, and is known for its important port, which is one of the busiest on the Mediterranean Sea. 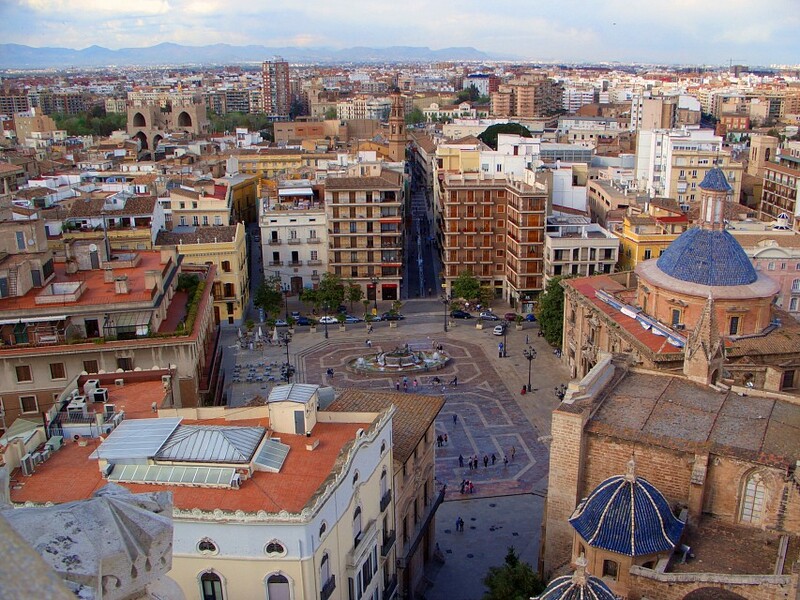 Like many other Spanish cities, Valencia is a bilingual city, with widespread use of both Spanish and Valencian, which is closely related to the Catalan language. While Spanish is the city’s predominant language due to its focus on tourism, you will see traces of the Valencian language throughout the city on its street signs and menus. 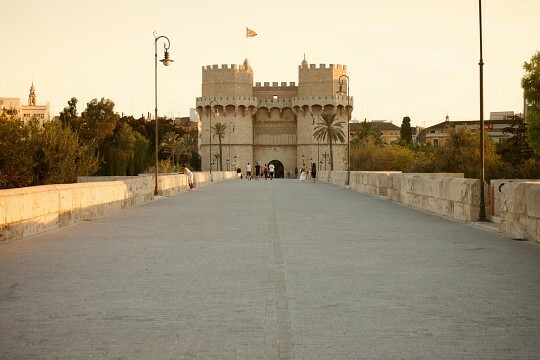 Valencia was founded in 138 BC by the Romans, who called it “Valentia Edetanorum”. In the following centuries, the area was invaded and ruled by the Visigoths and the Moors . Eventually, it was conquered by King James I of Aragon in 1238, the Moors were exiled, and the Valencian language and culture, still preserved today, began to develop. During the 15th century, it experienced a Golden Age, when its arts, culture, and economy flourished. Then in 1707, the Kingdom of Valencia was abolished, and the area became part of what is now known as Spain. While the culture and traditions of Valencia were repressed under various governments, in recent decades they have been allowed to flourish, including the teaching of the Valencian language in all public schools. Valencia is home to a wide selection of attractions that will impress any visitor, including impressive museums, architectural wonders; historic sites, religious buildings; gardens, and plazas bustling with activity. 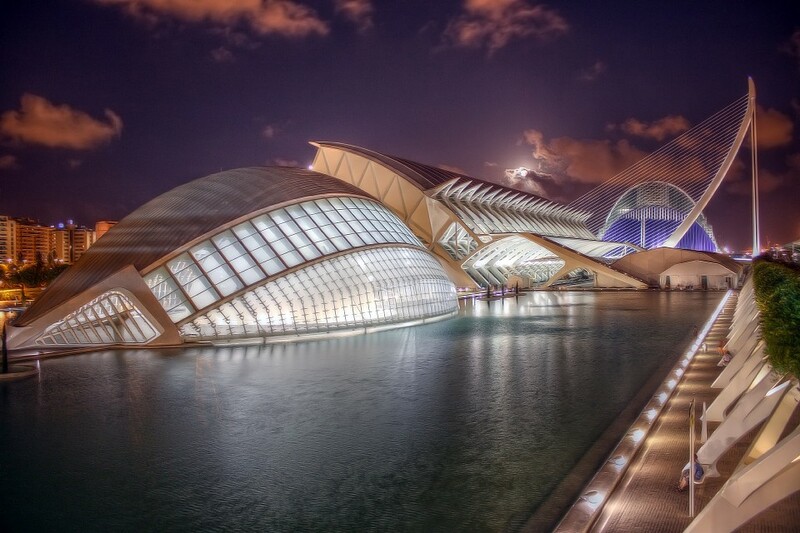 The City of Arts and Sciences, an architectural and cultural complex, is Valencia’s most famous modern attraction. Its most popular buildings are L'Hemisfèric's IMAX cinema and planetarium, El Museu de les Ciències Príncipe Felipe interactive science museum, and L'Oceanogràfic, which is the largest oceanarium in Europe. Other features include L’Umbracle's landscaped walk, El Palau de les Arts Reina Sofia's opera house and performing arts center, and L'Àgora, a multifunctional covered space used for concerts, exhibitions, and events like the Valencia Open 500 tennis tournament. The “Silk Exchange”, also known as Lonja de la Seda in Spanish, was constructed between 1482 and 1548 for use by local merchants. By the end of the 17th century, the city’s silk industry had become so impressive that the building became known by the name it retains to this day. 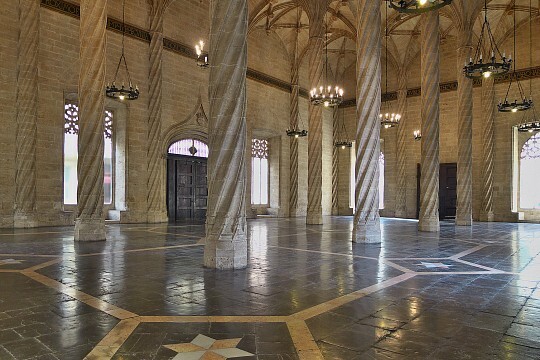 The late Gothic-style building known for its magnificent architecture was named a UNESCO World Heritage Site in 1996. 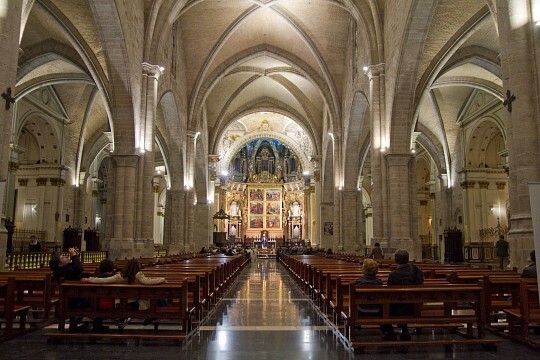 Known as “Catedral de Santa María de Valencia” in Spanish, Valencia’s beautiful Gothic cathedral was constructed between the 13th and 15th centuries. One of its most famous artifacts is a chalice that is thought to be the Holy Grail , which has been used as the official papal chalice of many popes. The “Turia Garden” is a park in the former riverbed of the Turia River. In fact, it is the largest park in Spain, and is also one of the most visited attractions in the entire country. It contains numerous paths for cyclists and pedestrians as well as fountains, sports facilities, and a zen garden. If you have children, Gulliver Park is a must-visit attraction in Valencia. This imaginative children’s adventure playground features an enormous model of the protagonist from the famous book, Gulliver’s Travels , tied to the ground with ropes that children can climb. Slides, ladders, and other play structures are formed by his clothing. Another popular attraction within the garden is Bioparc Valencia, a 25-acre zoo which showcases over 250 animal species in various African habitats. One of the city’s most iconic landmarks, the Torres de Serranos towers are the best preserved of twelve gates that lined the city’s medieval walls starting in the 14th century. They were the main entrance to the city, and also served as a prison for nobility for a few centuries. You won’t want to miss out on the chance to climb to the top of these towers due to their spectacular views of the city. The largest plaza in the city is the site of the exquisite City Hall, or Ayuntamiento in Spanish, and the central post office. Locals and tourists alike fill the cafés and restaurants surrounding the plaza while enjoying the views of its large fountain. The Plaza de Toros de Valencia is the city’s bullring, which was built in the late 19th century. If you’re interested in learning about one of Spain’s most famous (and controversial) cultural traditions by seeing it first-hand, you should definitely attend a bullfight. Be sure to read up about bullfighting before you go so that you understand the reasoning behind it. 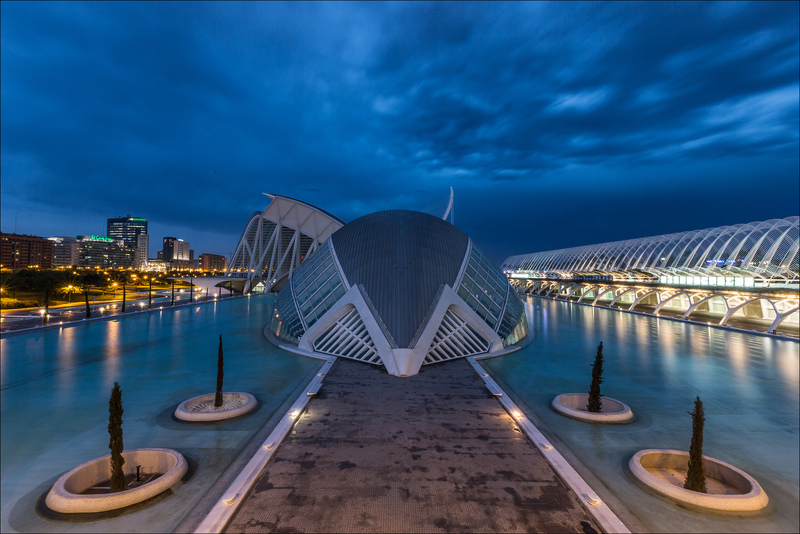 Valencia’s fine arts museum, with its distinctive blue dome, contains a collection of over 2,000 pieces of artwork. It features several pieces by famous artists, including paintings by Goya, El Greco, Pinturicchio, and a self-portrait of Diego Velázquez, a 17th-century Spanish painter who is considered to be one of the country’s most important artists. If you aren’t lucky enough to visit Valencia during the annual Las Fallas festival, then it’s worth a visit to the Fallas Museum, where you can see some of the ninots (elaborate satirical paper-mâché sculptures) that have escaped their fiery fate due to winning the popular vote in years past. Finally, Valencia has two urban beaches: Playa de las Arenas and Playa de la Malvarrosa. Both beaches are known for their fine golden sand and extensive boardwalks, which contain many restaurants and shops. While Valencia has many fascinating cultural traditions, two in particular are famous around the world: Las Fallas and La Tomatina. Each March, thousands of people flock to Valencia for a week-long festival known as Las Fallas , a celebration which combines artistry, traditional dress, food, music, and fireworks. The festival’s most famous event is La Cremà, when each neighborhood’s elaborate satirical paper-mâché sculpture is filled with fireworks that are then lit, exploding in a cacophony of light and sound that is unlike anything you’ve ever experienced before. If you don’t like crowds or are frightened of firecrackers then this probably isn’t the festival for you. La Tomatina is one of Spain’s strangest festivals. Each August, this famous tomato fight takes place in the nearby town of Buñol. If you want to attend, you’ll need to sign up in advance, as they’ve recently decided to limit the number of participants. Due to its size and large immigrant population, Valencia is home to restaurants that feature most cuisines from around the world. You can find dining establishments throughout the city, particularly around large plazas such as Plaza del Ayuntamiento. The Russafa neighborhood also boasts a large selection of restaurants. That said, if you’re in Valencia, you should really try their traditional cuisine. The most famous Valencian dish is paella, a rice dish often made with either meat or seafood. Due to its location near the coast, it also has exquisite seafood such as squid, known as calamares in Spanish. If you have a sweet tooth, then you should try horchata, a sweet milky drink. Horchata is made from tigernuts, known as chufas in Spanish, water, and milk. You’ll find it everywhere in the summertime, when it is best enjoyed cold with a farton, a long, glazed pastry that you dip into the drink. 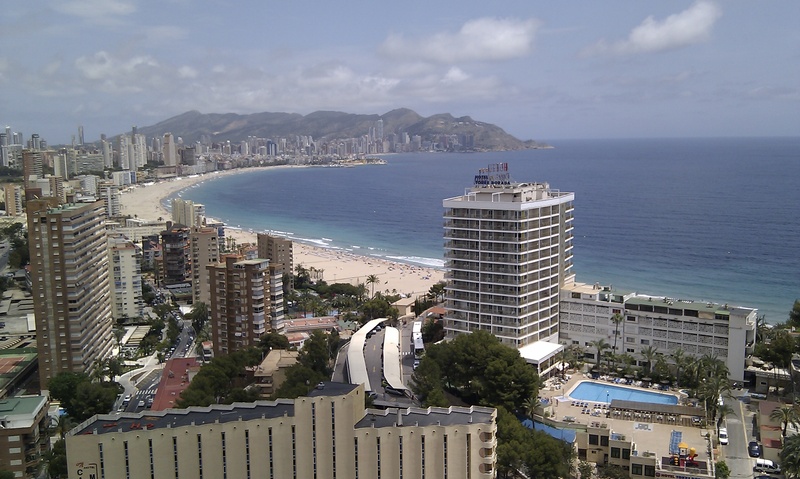 Valencia offers a wide range of accommodation, including luxury hotels, budget hotels, bed and breakfasts, and cheap hostels. Most hostels and budget hotels are located in or near the city center, while luxury hotels with sea views are often found near the City of Arts and Sciences. Most hostels cost between €10 ($12) and €20 ($23) per person per night, while hotel prices start at €50 ($58) per room per night. 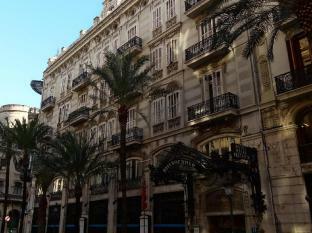 If you love shopping, then Valencia will be your own personal paradise. 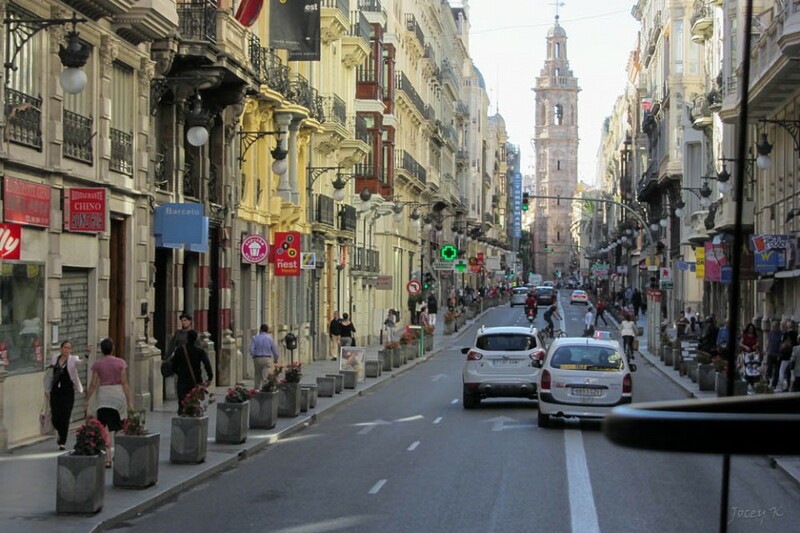 One of the city’s most popular shopping streets is Carrer de Colón, which features shops like H&M, Zara, and Mango. You’ll also find small boutiques hidden throughout the Ciutat Vella, while Calle la Pau and Calle de Marqués de Dos Aguas are two hotspots for luxury shopping. If you’re more interested in purchasing food than clothing, then you should head to one of the city’s large public markets. 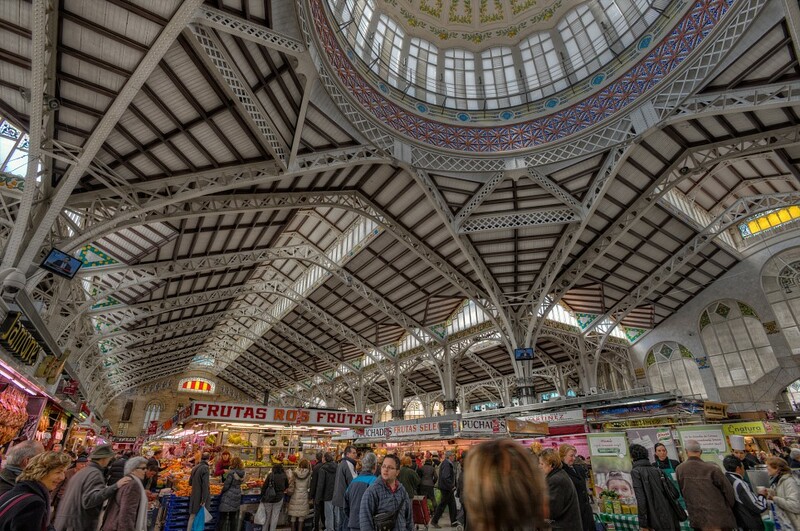 Known as Mercat Central in Valencian, the city’s beautiful modernist-style public market is one of the longest-running markets in Europe. It is a popular attraction for both locals and tourists due to its wide selection of items for sale, particularly local food products like oranges and artichokes. In addition to perusing the seemingly endless aisles of fresh fish, meat, fruit, and vegetables, you can grab a bite to eat from one of the market’s small restaurants or purchase a souvenir. Valencia has an extensive public transportation system and is a very pedestrian-friendly city, so you should have no problem getting around. Public transportation options include the EMT urban bus system and Metrovalencia, a suburban metro system with 5 lines. If you like cycling, the city also provides a bicycle rental system known as Valenbisi, which has 250 stations throughout the city. In terms of getting to and from Valencia, the city has an international airport which provides flights to numerous European cities, as well as two train stations in the city center which provide high-speed services to cities such as Madrid, Barcelona, and Seville. There’s not much need to worry about safety in Valencia since it has relatively low crime rates. However, theft does occasionally occur, so make sure to always keep your belongings with you, and avoid handling money in public. It’s also a good idea to hold onto your purse and keep your wallet in a front pocket when out in public.